Since 1953, year in which the World Championship of Makes was reglamented, there have been many formulaes that have defined this category. In its inception, it covered vehicles that were half Gran Turismo and half Prototypes, under the name Sport. For the newbies, this two-seater apparatusses with windshields that litterally wrapped the cockpit, were the closest thing to the image that they had of a daily use sports car. But that image did not last very long, due to a series of realities. The Championship was something difficult to obtain, and the carmakers saw in it as a huge publicity source. The ambition to be in the spotlight, forced them to perfect the cars year after year. The regulations were semi-directed by the Automobile Club de´l Ouest, entity that organizes the 24 Hours of Le Mans, the prime attraction of the category, until the commercial interests overtook her. Thus, succesive modifications in the regulations encouraged the participation during the sixties, the decade of the American "monsters", who took the category for themselves, sweeping the competition away with the undeniable prowess of its 500 brake horse power and 7-litre engines. The “Sports” category was created in 1953. Until 1965, Ferrari had won all of the championships excepting the 1955 (Mercedes Benz 300 SLR - Fangio) and 1959 (Aston Martin). The 1961,´62, and ´63 championships were not difficult at all for Ferrari, given the absence of strong rivals, but in 1964 a monstrous investment plan, puts Ford in the expectative seat. 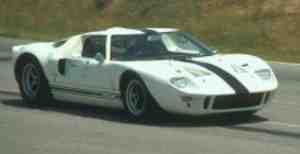 Although the Ford GT40's had serious transmission problems, and abandoned most of the races, the Le Mans and Reims straights put them as the fastest cars in the category. A Ferrari 275P (Guichet-Vacarella) wins Le Mans and, after the triumphs in Sebring, Reims, Paris 1000 kms., and the Nürburgring, they win the championship. In 1963 the Porsche 904 Carrera GTS had been introduced. This model is considered by Porsche AG as the predecessor of the prototypes that dominated the raceways at the end of the sixties and beginning of the seventies. The 904 Carrera's were powered by different powertrains: 1 eight cylinders, various versions of the six-cylinder, but they basically used a 2-Litre four cylinder engine. The power developed by this engine, reached the 180 bhp @ 7200 rpm's; more than enough to reach 260 km/h as a top speed, with acceleration figures to 100 km/h under 6 seconds. They weighed 650 kg's. The Ferrari-Ford confrontation was more alive than ever. As always, the primary target for that year was the 24 Hours of Le Mans. 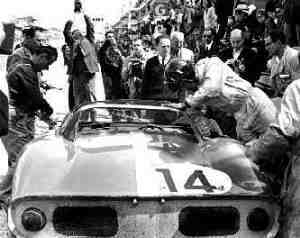 By the time Le Mans was the next race, Ford had won the 2000 km of Daytona and Ferrari had had it’s share at Sebring, Monza, Targa Florio and Nürburgring. The Ford entry consisted in the brand new 7-litre car, as the Ferrari lineup included the following models: 330 P2, 275 P2, 275 LM and 365 P.
Ford had 6 cars on the starting grid, and Ferrari had 10, but all of the 16 works cars either abandon or fail to make it into the contenders group, and a privately- entered N.A.R.T. Ferrari 275 LM wins the race. At the end of the season, and thanks to the Cobra model, Ford conquers the Sport Championship, which was independent to the Prototype Championship, which fell into Ferrari’s hands. The great duel is about to take place. Ford prepares another 7-litre and Ferrari remains with its 4-litre V12. In the first race of the year, the Daytona 24 hours, Ferrari doesn’t show up, leaving the race to Ford. The second round takes place in SPA Francorchamps where the Ferrari P3 beats the Ford MkIII, repeating the victory at Monza, but succumbs at the Nürburgring and the Targa Florio. Le Mans arrives, and no less than eight Ford MkIII and seven Ferrari are at the starting grid. Ford takes a top three finish and not one Ferrari comes close to a good finish. America had beaten Europe. There are lots of arguments to justify Ford’s victory, but the most common of all is the huge amounts of dollars behind every MkIII. 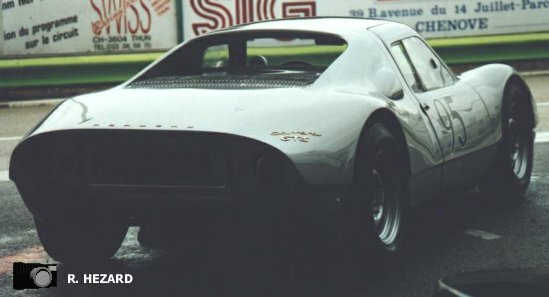 At mid-year, Ferrari, with it’s 275 LM was fighting hard against the GT40´s for the Sports Championship, while another battle –this one against Porsche- took place for the Prototype Championship. At the 24 hours of Le Mans, and in spite that Ferrari enters eight cars, the Ford MkIV gets the victory in an astounding form. A few days later Ferrari defines both the Sports and the Prototypes Championships at Brands Hatch, where it defeats Ford and Porsche, respectively. 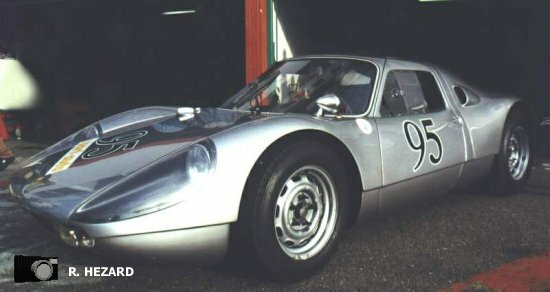 In 1967 Porsche raced with it’s new models, the 910 and 907 with tubular chassis. The 907 was an aerodynamically improved version and it debuted at the 24 Hours of Le Mans in 1967. It’s biggest success was obtained at the 24 hours of Daytona in 1968, where it took a top three podium. 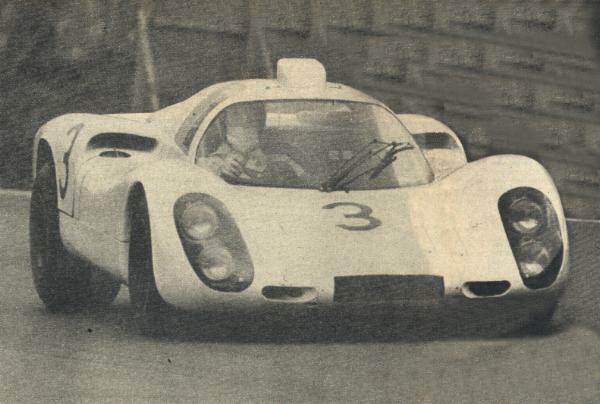 The Porsche 907: Eight cylinders,2195 cm3. 270 BHP. 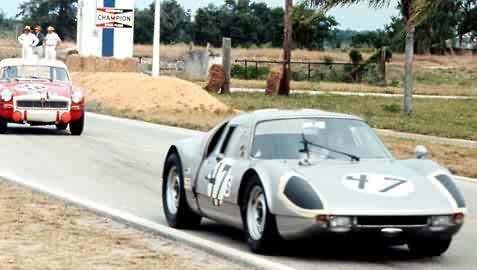 First absolute victories for Porsche at Daytona, Sebring and the Targa Florio in 1968. 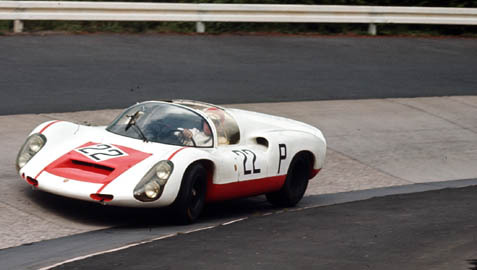 The car that opened the way to the 3-litre 908´s.